All teens know about it... Do you? Even Olympic gold medalist and U.S. figure skating champion Tara Lipinski is aware of the greatness of this book! 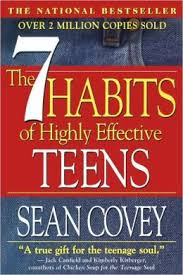 "The 7 Habits Of Highly Effective Teens is a real-life guide to help teens be their best. Setting goals and writing them down is one of the most important things you can do. Commit them to memory, stay focused, and develop the stamina to go the distance. If you do, you can achieve any goal you set" -Tara Lipinski. Many teens struggle in everyday life, and so does Tara; she is just like all you teens out there right now. So who says you can't overcome your adversities and be an achiever! This book has won the title of "The National Best Seller" along with "Over 2 Million Copies Sold". Sounds like it's worth the time and effort to read. Do you want to be an overall more happy and aware person? This book will give you new insight into the meaning of being powerfully successful. If you feel down or depressed, this book is a great pick-me-up! It teaches that all teens struggle, and that you are not alone! It demonstrates the importance of setting goals and sticking to them to achieve your dreams. Take action, don't be lazy! Go now and get a copy of your own. How could you pass up the opportunity to improve who you are now?